There has recently been another outbreak of E coli in romaine lettuce. So far according to The Centers for Disease Control, many have been affected in the U.S and Canada with the disease. E coli is known to do severe damage to the human body. Some symptoms to look out for would be bloody diarrhea, severe stomach cramps, and vomiting. 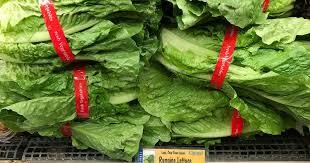 Most symptoms occur within two and eight days of consuming romaine lettuce that is infected. Middle aged people with a healthy body usually see their symptoms decrease within a week with plenty of rest and staying hydrated. Those are the main symptoms but however it can still get worse. E coli can cause a human body to have a complication called hemolytic uremic syndrome (HUS). This is a form of kidney failure. Some symptoms of HUS can consist of abdominal pain, fever, decreased urination, random and inexplicable bruising and bleeding from the mouth and nose. Younger children and elderly persons are more likely to develop this disease because they both have weaker immune systems. It is informed that if any person is experiencing these symptoms that they should see a doctor to be safe. Also, there is basic food safety that can be followed to prevent this disease as well. One should wash his or her hands regularly especially before and after handling food, touching animals or after coming in contact with another human. Another basic food safety precaution would be separating foods when cooking in the kitchen. For example, the meat from the vegetables and the vegetables from the dairy, etc. Studies also show that e coli can be linked to long term health problems. If a person gets very sick with E coli, they are 2.1 times more likely to have a stroke or a heart attack according to data collected by a Walkerton Health Study. The team has also concluded there is risk of hypertension, renal impairment and cardiovascular disease within eight years of getting sick.